Calculating running totals is a common task when reporting warehouse or financial balance. The theory behind running totals is quite easy as it is simply sum of values on all previous rows. Some reporting tools provide native support for running total, but some tools not. The real problems comes when we need to calculate running totals inside query. The main problems are with performance and sometimes complexity of such solution. Jeff Moden has a great article about calculating running totals using T-SQL on SQL Server Central: Solving the “Running Total” & “Ordinal Rank” Problems. For relatively small record sets the T-SQL solution is quite usable, but for larger record sets the real performance problems comes (a lot of reads and processing). Although there are many articles related to running totals, nearly non of them describes the fastest possible method for calculating running totals – CLR. On the other side the CLR solution brings some issues which we have to take in mind. I have updated the article after some comments and further email communication with Paul White MVP (blog). Paul has mentioned issues with rows ordering for calculation of the running totals so this updated version reflect this and also I’ve added a security check to the functions so those functions throws exceptions when and issue with row ordering is detected. As I mentioned above, the CLR solution is the simplest and quickest solution for the running totals. Before we start with the CLR solution we will prepare a testing database and test data. In our implementation we will use a simple scalar CLR function. This function will store current value for next row and in that row it will retrieve the value from previous row and calculate total. For this purpose we will use CallContext class (See MSDN for details). Here is testing class and function for BigInt data type. /// Storage Structure for holding actual Total and row number for security check. val parameter represents the value to be accumulated into the running total. id parameter is identification of the function in a select statement if there are more functions used in single select (eg. accumulating costs and incomes separately) – it is necessary to have separate storage for each call of the function. rowNo is parameter for the security check to ensure, that rows are accumulated in expected order and correct results are provided. In case an issue with accumulation order is detected, an exception is thrown so user immediately knows the calculation is wrong. The security check is based on communication with Paul White (MVP) as mentioned above and the value for this parameter will be provided by ROW_NUMBER() windowing function with expected order. nullValue allows specify value for null handling (eg. you may want to accumulate some particular value in case the val is null. Once the assembly and function is created, we can start testing the function on our test tables. Fist test will be done on simple queries which will have a simple serial plan. Please note the ROW_NUMBER() OVER(ORDER BY RowID). This is the security check by which we provide RowNumber in the order of RowID. In case of some inconsistencies (rows arrive in different order as required. This can happen because the query engine doesn’t guarantee the rows order until final result set is received) an exception will be thrown. Table 'SmallTable'. Scan count 1, logical reads 5, physical reads 0, read-ahead reads 0, lob logical reads 0, lob physical reads 0, lob read-ahead reads 0. CPU time = 0 ms,  elapsed time = 3 ms. Non of the T-SQL methods will produce such simple query plan. The Sequence Project is calculation of the ROW_NUMBER() for security check. Now let test the situation if we use the function two times in the same query.
.           .           .                    .           .
As we can see, we have again correct results. Note, that each call to the fn_RunningTotalInt has different ID. In case we use same ID the execution will fail with detection of rows being processed in unexpected order. This is caused by the fact that in case of using identical id, the internal counters are used by both functions instead of single counter for each function call. As I have mentioned at the beginning fo the article, this update was done upon Paul White comments, so now the function detect such issues if they occurs. Let’s simulate such issue. The issue is, that the the scalar operator is after a sort in descending order which is being done for the DescendingRowOrder and prior the final sort. However if such issue occurs, it is correctly detected and an exception raised. This issue can occur even the scalar operator was the last operator as the order of rows is not guaranteed by the query processor until final result is received, but in normal cases in single threaded processing it generally works and in case of some issues, we have the check implemented. Now we will focus on the NULL values handling. Let’s run another simple query with some NULL values. Here we can see, that if we pass NULL, then the NULL values are ignored and in the other two cases the NULL values are handled as 0 respectively 10. Till now we had tested only simple queries, which produce serial plan. But what if we will use the function in much more complicated queries, or queries processing high amount of data and which produce parallel query plan on multi processor (core) systems. Let’s simulate such scenario on our big table, which should produce a parallel plan on multi core system and default settings of SQL Server. In this case the results are correct as Compute Scalar was performed after the parallel streams were garthered. In case the computation of scalar running total value occured prior the parallel streams are garthered, then again an issue that rows are not processed in corect order may occur. As we have tested and seen, the CLR version of calculation running totals produces very simple query plans and is one of the fastest methods to calculate running totals. The CLR functions are really simple and fast. On one side the CLR solution for running totals is one of the fastest, but on the other side we have to remember that this solution requires, that records are processed in order in which the running totals should be calculated. However the Query Optimizer and Query Processor doesn’t guarantee, that the records will be processed in particular order. It only guarantees, that the final output will be sorced according the ORDER BY clause. To ensure, that those function to not produce incorrect results a security check in the form of rowNo generated by ROW_NUMBER() function needs to be part of the solution an in case the solution could produce incorrect results, it raises an exception. So I would like to thank gain to Paul White MVP (blog) for his notes. This blog post is inspired by forum thread on SQL Server Central Convert CSV values in three columns to rows. On many sites there are comparison of string splitting functions using pure T-SQL. But not much of them also mention the CLR way of doing it. On small strings with a few elements the T-SQL solution is unbeatable in speed. But when the number of elements in the string increase, the situation is completely different. In this comparison I will use one of the quickest T-SQL solution vs. a CLR solution using regular expressions. For the fastest CLR solution, check my blog post: Fastest CSV strings splitting using CLR (T-SQL vs. CLR revisited). Probably the quickest known T-SQL solution is function mentioned by Jeff Moden in the forum thread http://www.sqlservercentral.com/Forums/FindPost944589.aspx. -- Split a given string at a given delimiter and return a list of the split elements (items). ----===== Conditionally drop the test tables to make reruns easier for testing. ----===== Create and populate a test table on the fly (this is NOT a part of the solution). --    externally from this function. -- 3. Optimized for use with CROSS APPLY. -- 4. Does not "trim" elements just in case leading or trailing blanks are intended. --    nature of VARCHAR(MAX) whether it fits in-row or not. --    that the UNPIVOT method is quite machine dependent and can slow things down quite a bit. --    slower and slightly more CPU intensive than the traditional WHERE N < LEN(@pString) + 2. --    slower and slightly more CPU intensive than the traditional ORDER BY (SELECT N). -- Rev 00 - 20 Jan 2010 - Concept: Lynn Pettis and others. --          SELECT List for that tiny bit of extra speed. --          actually work for this type of function. --          makes no external references. For the CLR we will use the RegEx function I mentioned in one of my previous blog post: SQL Server 2005 and SQL Server 2008 Regular Expressions and pattern matching. To make the comparison more interesting I will use the table structure as Jeff Moden has used in his post http://www.sqlservercentral.com/Forums/FindPost988659.aspx. You can also took on the comparison of different T-SQL solutions made by Jeff in the mentioned thread. We will build 3 test data table. One for string with 16 element (CsvTest), one for 100 element (CSVTest3) and one for 1333 elements (CSVTest2). The 1333 elements is near the varchar(8000) for which the T-SQL version of DelimitedSplit8K is optimized. CROSS JOIN Tally t4 --can produce row sets up 121 million. CROSS JOIN Tally t2;  --can produce row sets up 121 million. In the CLR RegEx version is used following regular expression : ‘(d+?)(?:,|$)’. It could be also possible to use ‘d+’ in this situation. CPU time = 15 ms, elapsed time = 26 ms.
Table 'CsvTest'. Scan count 1, logical reads 262, physical reads 2, read-ahead reads 281, lob logical reads 0, lob physical reads 0, lob read-ahead reads 0. CPU time = 1841 ms,  elapsed time = 1922 ms.
CPU time = 16 ms, elapsed time = 22 ms.
Table 'CsvTest'. Scan count 5, logical reads 781, physical reads 5, read-ahead reads 281, lob logical reads 0, lob physical reads 0, lob read-ahead reads 0. CPU time = 77173 ms,  elapsed time = 25480 ms. Here we can see, that the T-SQL version is unbeatable. The T-SQL took about 2 seconds, while the CLR-RegEx took more than 25 seconds. We can also notice, that the T-SQL version had nearly 3 times less reads. CPU time = 0 ms, elapsed time = 27 ms.
Table 'CsvTest3'. Scan count 1, logical reads 1675, physical reads 4, read-ahead reads 1677, lob logical reads 0, lob physical reads 0, lob read-ahead reads 0. CPU time = 19890 ms, elapsed time = 20019 ms.
CPU time = 0 ms, elapsed time = 18 ms.
Table 'CsvTest3'. Scan count 5, logical reads 1836, physical reads 5, read-ahead reads 1677, lob logical reads 0, lob physical reads 0, lob read-ahead reads 0. CPU time = 79639 ms, elapsed time = 26602 ms. Here we can see that the duration for T-SQL version rapidly increased to 20 seconds, while the duration of CRL-RegEx is nearly the same as for 16 elements in string not a whole 26 and half seconds. Also Reds are nearly the same. CPU time = 0 ms, elapsed time = 25 ms.
Table 'CsvTest2'. Scan count 1, logical reads 74, physical reads 2, read-ahead reads 72, lob logical reads 367392280, lob physical reads 2500, lob read-ahead reads 0. CPU time = 2745696 ms, elapsed time = 2758753 ms.
CPU time = 0 ms, elapsed time = 43 ms.
Table 'CsvTest2'. Scan count 5, logical reads 217, physical reads 5, read-ahead reads 72, lob logical reads 320860, lob physical reads 2494, lob read-ahead reads 170000. CPU time = 170228 ms, elapsed time = 59624 ms.
From this results we can see, that when the length of the string increased and number of elements increased to 1333, the T-SQL version is nearly unusable and the CLR-RegEx is unbeatable by the T-SQL. 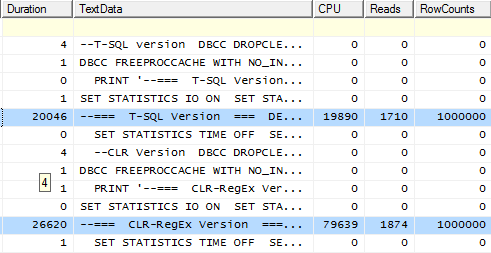 Here the T-SQL solution took nearly 46 minutes while the CLR-RegEx took only 1 minute. Also the T-SQL solution now has 1 144 times more reads. Here are some test of the CLR-RegEx solution on some very large strings. This test splits single very long string using the CLR-RegEx. The number of elements in the CSV controls the TOP clause in below testing query. We will use it for several scenarios. CPU time = 484 ms, elapsed time = 496 ms.
CPU time = 4352 ms, elapsed time = 20713 ms.
CPU time = 44320 ms, elapsed time = 88735 ms.
From the test and measuring done in this blog post we can find, that when we need to split relatively small strings with small elements count (<100 elements) then the T-SQL Solution is the quickest possible and unbeatable. When we have a moderate count of elements in the string (about 100) then it does not matter if we use the T-SQL or CLR-RegEx solution. Once the count of elements in the string increases (more than 100) then the CLR-RegEx starts being unbeatable and with high counts of elements (more than 1000, or even millions of elements) then the T-SQL solution is nearly unusable as we can see the results of 10 000 rows with 1333 elements each – the T-SQL version took 46 minutes, while the CLR-RegEx took only 1 minute. Also during all the tests, there was no occurrence of AppDomain Restart/(Unload/Load) when manipulating large strings using the CLR-RegEx solution. On some blogs I have found, that there was some AppDomain unloading and loading when using CLR but with combination of String.Split method. The RegEx solution doesn’t have such problems. If you are Czech, Polish or Turkis speaking and using SQL Server, then you can help to improve the SQL Server Books Online translations to these languages. On the Microsoft Language Portal Blog there is article, how you can help improve the books online. To write this blog post I was inspired by a question on Ask SQL Server Central.com about finding a substring between two characters. Some times it is necessary to process input string and retrieve some parts of them. For this purposes we can write some more complex T-SQL constructs or use the CLR functionality of SQL Server 2005 and SQL Server 2008 and write some functions for processing Regular Expressions. Generally all the string manipulations (especially on very large string values) are much better performing using a CLR scalar and table-valued functions than their equivalent using pure T-SQL code. Also using regular expression you do not need to write specialized functions for particular processing as you simply write a regular expression and use it in the RegEx function. For general info about writing a CLR functions read MSDN. More info on regular expressions you can find on Regular-Expressions.info and you can find inspiration also in the Regular Expression Library. For such use you can find a below SQLRegEx class which contains two functions – RegExMatch with is a scalar CLR function to return particular group from within particular match and CLR table-valued function RegExMatches which return all matches and groups. Below is a code snippet you can use to create an assembly. This is a scalar function which takes three arguments. First is the source string to be parsed using regular expressions. Second parameter is regular expression itself, third is a matchId (counted from 1 and which represents a match to be returned) to be returned if there could be more matches and fourth is a Group ID to be returned from within the regular expression match. When there is no group or you want to return simply the complete Match, pass 0. This is CLR table function and it returns all matches including each group in each match. The complete Match has groupID equal to 0 in the output. Input parameters are source string to be parsed using the regular expression a second is the regular expression pattern. Once we have a compiled assembly, we can register the assembly and function in database and start using them for various Regular Expressions processing. @groupID int --ID of the group in the match to be returned. GroupID = 0 represents a complete match. Eg. Split semicolon separated list of Key=Value pairs. Pair has the same matchId and Key has groupID = 1 and value has groupID=2. Without the WHERE Condition also the GroupID 0 will be returned which contains each pair. Hope, this article will help you using regular expressions in SQL Server and you will be able to simplify and speed-up your queries. You may be also interested in my next post SQL Server Regular Expressions – Replacements which describes possibilities of string replacements using regular expressions.